Hi peeps! Hope you've been enjoying our 'normal' summer. The new age unemployed, misled, pig-ignorant and disaffected hippy freaks have been telling us it's due to climate change because of cars and planes. What a load of utter s--t. We've had this weather for many millennia. Cold rainy summers and misery. Prior to that a tropical climate when there were no cars or planes. Last year the same morons were saying it was global warming because we had a rare hot summer. Now they are calling it 'climate change' because it's cold and wet. These cretins need to go and pitch their squalid tents on the sun -not the newspaper- as it's responsible for any major weather and CO2 changes on our planet. Meanwhile in showbiz land, the last installment of the Jason Bourne trilogy, 'Bourne Ultimatum' premiered in rainy Leicester Square, London. The film, directed by the great Paul Greengrass, is the closing chapter on the persecution of Jason Bourne played very well by MATT DAMON. At the premiere it was so wet that MATT DAMON even took his jacket off to try and keep it dry whilst signing autographs. Not many celebs take the time to sign autographs in heavy rain. Matt even took good time to give us the pictures we wanted and EVEN arrived on time! He was the first of the celeb guests to arrive, which is a rarity and meant that I could send my pictures quickly to the paper's picture desks. If all celebs were like this my job would be so easy. Other guests at the premiere were JULIA STYLES, -Matt's co- star- JOAN ALLEN, SCOTT GLEN, PADDY CONSIDINE, -whoever he is- HELENA CHRISTIANSEN, Rod Stewart's gorgeous daughter KIMBERLY STEWART, STEPHEN FRY, RACHEL STEVENS, NEVE CAMPBELL, LISA SNOWDON, pocket sized pop star PRINCE -who didn't stop for pictures or fans so we booed him en masse- and Eastender's NATALIE CASSIDY sporting a whole new look which seems to suits her -compared with what she used to wear. The flick, btw, is the best of the trilogy and worth seeing. One of the biggest festivals of the summer -The V Festival- kicked off in style this month with a stellar line up of bands which included : PINK, FOO FIGHTERS, BASEMENT JAXX, LILY ALLEN, MANIC STREET PREACHERS, JAMES KASABIAN, SNOW PATROL, and THE KILLERS as well as a load of other rubbish bands. The V festival weekender is one of the better festivals of the summer, but can still improve loads. For instance, a mediocre burger in the hospitality area should not cost £6!!!! A bad coffee from the same stall should not cost £2.50!! It's this lack of respect for people that must improve and this was HOSPITALITY. It was cheaper to go out of the hospitality area and find -slightly- better and cheaper food. Luckily, we had a fridge full of free beers in the tiny press 'centre' -portakabin- so things could've been worse. Saying that, the beers ran out too quickly and we didn't get a free stock up until the NEXT day! Luckily, my friends and I -Paul and Rune- smuggled supplies in which included champagne, whisky, red wine and a Norwegian liqueur which tasted like petrol at first but then the aftertaste was smoother. Needless to say, once work had finished for the night -covered the bands and sent the pictures out- we indulged in this -in hindsight- cocktail of death. The champagne was the best bit but there was a limit to how much we could bring in. So we started on the rest of the menu. By 2 am with all bottles empty we were zombies and lost Paul. We briefly looked for him to no avail. It was on the way back an hour later when Rune fell for the fifth time -slippery mud possibly?- that we found Paul. Rune had tripped over him. Paul was out cold. We helped him up to help him to his car -we were all sleeping in our cars, luckily all big and comfy- however Paul decided that he was able to get back to his car unescorted. Rune and I headed back to our vehicles via one more bar stop. Eventually, we got to our four wheeled beds. I woke up at 10.15am and couldn't move. I had -not surprisingly- my worst hangover ever. Eventually a couple of hours later when my limbs came to life the boys and I met for breakfast. No one said a thing. It turned out Paul had slept on a field most of the night -which explained why he looked like he'd been run over by a tractor- until he regained consciousness and eventually was able to find his car. It did however take him another twenty minutes or so to get INTO it but that's another story. I spent the rest of Sunday drinking lots of water and coffee, vowing not to drink another drop of alcohol for at least a week...There were not as many celebs attending the festival this year, sadly. It's easier and far more financially rewarding to sell pics of celebs milling around the festival clad in wellies than band pics. This year we only had GARETH GATES, GAIL PORTER, SARAH HARDING, JAMIE OLIVER and a couple of other z-listers. So you can appreciate my predicament. Never mind, another day another do. 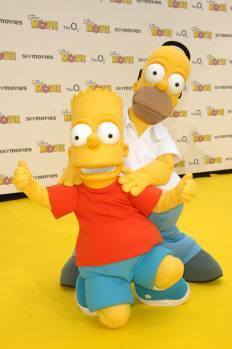 The most popular film event of the year so far has to be The Simpsons premiere. The most witty, funny, clever, successful TV cartoon series ever has been 'transformed' for the silver screen. OK, sort of transformed. It's like one long episode, but hey, if it ain't broke don't fix it. I found it very funny though predictably so. The premiere, held at the the new revitalized 'Millennium Dome' in Greenwich was very colourful. There were Simpsons characters running all over the place on the yellow carpet. By the entrance of the dome or 'The O2 Arena' -Corporate sponsorship- there were cinema staff giving away hundreds of pink iced doughnuts. Celebs on the long yellow carpet included: MCFLY, RICHARD and JUDY with their daughter who looked quite cute, ISABELLA HERVEY, MATT WILLIS, SIMON WEBBE, STEPHEN REDGRAVE and family, STEPHEN GATELY, -with no family- VIC REEVES and family, EDITH BOWMAN, GAIL PORTER, BART and HOMER SIMPSON. Go see it! The UK's most popular glamour model and successful author KATIE PRICE -a.k.a. JORDAN - launched her perfume 'Stunning' at the Kensington Roof Gardens in London. The glamour girl's latest foray into the perfume business was launched with a photocall and press champagne reception. Needless to say I had to be there. She arrived in a long cream silk gown more akin to a wedding dress. As always she looked spectacular and gave loads of time at the shoot. Jordan has always been very professional and has always been great to work with. She's no stuck up diva. After the shoot was over, she changed into blue jeans and yellow top and came to chat to us and see how the pictures we took came out. Nice gal. Next month dear readers I will be bringing you the goss from the Venice Film Festival and, if I have time, the Toronto Film Festival. It's in CA-NA-DA, peeps. (For those on the Welsh hills. )In the mean time stay safe, keep those emails coming, travel by air, enjoy your hols, drive your cars and enjoy life. I will. Over and Out, see ya next month. WORDS AND ALL PICTURES COPYRIGHT JOE ALVAREZ 2007.